West Worcestershire MP Harriett Baldwin has written to the head teacher and governors at Hanley Castle High School to offer her assistance over securing funding for school hall repairs. The MP contacted the school following reports that funding is being sought for refurbishment of the school's hall which is used for formal events and some classes. The work will include buying new seating and blinds as well as new lighting, new doors, new flooring and room decoration. Harriett has written to head teacher Lindsey Cooke as well as the school's governors, offering her help to secure funds to speed up this refurbishment project. Over the last five years, the school has received capital investment totalling £1.7 million to fund new science classrooms and a brand new sixth form block and next year the school will get an extra 5.7 per cent of school funding to help with historic imbalances suffered by Worcestershire schools. Harriett commented: "I am sure some parents will want to fundraise towards this good cause at this excellent school. I have been a strong supporter of our local schools and where requested, I have supported bids for capital funding to improve school buildings. "We have seen millions of pounds spent across our local secondary schools with impressive new teaching blocks built at The Chase, Pershore High School, Tenbury High School and Hanley Castle High School in my constituency. "I was sorry to see that the requests for funding to carry out refurbishment work have become sensationalised and politicised, and I was eager to make the point to the head teacher and her governors that I am happy to support a formal bid for funding from central Government sources. "I hope that following the school's successful funding bids for the new science classrooms and a fantastic new sixth form block, we can work together to secure funds for this latest refurbishment project." Harriett has been a constant campaigner to redress the historical imbalance in the funding deal for county schools and praised the Government's delivery of one of her key election pledges when the new formula was announced last year. The new deal which will see £1.3 billion extra allocated to schools in England next year with the introduction of a minimum funding level and a cash increase for every school. From next year, each secondary school pupil will attract minimum funding of £4,800 and primary school pupils will attract at least £3,500. Schools in West Worcestershire will get at least 0.7 per cent more money with schools getting, on average 3.2 per cent, and some schools getting as much as 9.1 per cent more following the new funding formula introduction. 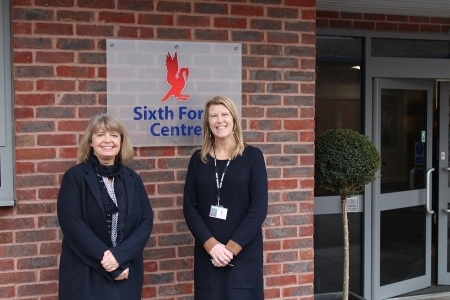 Photo: Harriett meets with Hanley Castle High School head teacher Lindsey Cooke at the school's brand new Sixth Form block.